Both citizens and companies are brushing up on their English. Although many Japanese speak English, the educational system is increasing its offerings to allow people to volunteer and have better interactions with visitors. While Japan has efficient public transportation, with the Shinjuku Station in Tokyo serving over a million commuters daily, the Olympics will put demands on the system, making it necessary to adjust the train schedule. At the same time, road construction is underway, particularly on roads leading to popular tourist destinations that currently don’t accommodate heavy traffic. A new railway is planned to link the Haneda airport and the Tokyo Station to cut the travel time from 30 minutes to 18 minutes. Also, from Narita Airport, it will take only 36 minutes instead of almost an hour. Although Japan has some no-smoking rules and restricted smoking areas, there are few regulations governing smoking in restaurants. Many establishments have smoking and non-smoking areas, but a movement is underway to introduce more stringent smoking policies in restaurants. Cultural heritage site renovation is underway. Because Japan experiences the recurrence of natural climate events such as heavy rains, earthquakes, and tsunamis, updating these sites is done on a more or less regular basis. But with the Olympics looming, attractions such as the Himeji Castle, the Hiroshima Peace Museum, and Tosho Gu, for example, are undergoing serious renovation to be completed in late 2019 or 2020. Smaller local airports will be enlarged to handle the more than 13 million tourists expected for the 2020 games—that’s in addition to the 27 million tourists who visited Japan last year. Japan is already revamping its customs and immigration infrastructure to meet the increased demand. English signage is showing up more often in Japan to help visitors find their way around. Plus, there are plans to use robots to help visitors with language translation. 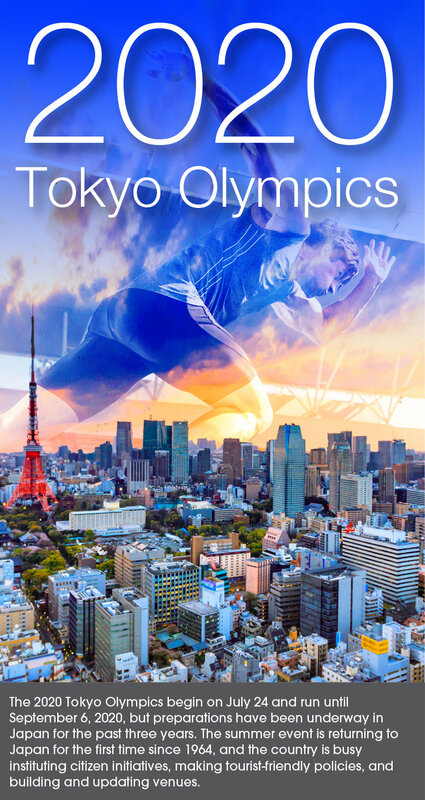 Venues are being renovated and rehabilitated, including the Heritage Zone, the Tokyo Bay Zone, the Football venues and the sites from the Olympic Village. 28 of the 33 competition venues in Tokyo are within 8 kilometers (4.97 miles) of the Olympic Village. But more than that, there is an expansion of exhibition facilities that will have staying power in the years ahead. The Aichi Sky Expo is a world-class exhibition center slated to open in September 2019. The exhibition center is directly connected to the Chubu international airport, making it an ideal base for visitors from overseas. Developers chose an English nickname to make it easier for overseas visitors to understand, settling on the word “Sky” to create an image of a bird spreading its wings toward the future, and “Expo,” a word people all over the world are familiar with and already use. Kyoto is adding a new hall to its exhibition center. The New Hall (2,000 sq. meters) and adjacent, existing Event Hall (3,000 sq. meters) may be used simultaneously as a 5,000 sq. meters space, allowing large-scale events of more than 4,000 attendees. This highly-independent attendee-only zone provides the perfect presentation venue for ceremonies, awards, parties, events, exhibitions, business meetings, and more. PACIFICO Yokohama is one of the largest convention complexes in Japan, equipped with all the functions required for any type of convention, such as meetings, incentive conventions, exhibitions, and events. The city government of Yokohama plans to finish a new exhibition hall on the waterfront adjacent to Pacifico Yokohama in 2019. With the addition of the new hall, total exhibition space will grow by 50% to roughly 30,000 sq. meters. The Tokyo metropolitan government plans to spend around 18 billion yen ($172 million) to add a new wing to Tokyo Big Sight, which is already Japan’s largest exhibition hall. The facility will be used as the media center for the Olympics. This 20% increase to Big Sight’s size will give it a total floor area of 270,000 sq. meters. Venues that are being built for sports and competitions will find a future as well. The Musashino Forest Sport Plaza was the first of eight new permanent venues to be completed. Partially solar powered, the 10,000-seat venue cost an estimated $300 million. Just a short walk away, the new Tokyo Stadium has a capacity for approximately 68,000-80,000 people. The old stadium, predominantly used for football, was torn down and renamed to avoid commercialization. Construction began on the new venue in 2016, and completion is scheduled for November 2019. Japan is making every effort to ensure that the 2020 Tokyo Olympics are accessible to everyone and uniquely representative of the culture. As you can tell from all the preparations underway, it isn’t too soon to make your own plans. All of us at Idea International will be happy to help you. Contact us now! « Big Changes are Coming to Japan!